As you might recall, just a couple of weeks ago on the 13.4.2016 the maestro Mariano Mores passed away. He composed some very famous tangos like Uno, Cuartito azul, Cafetín de Buenos Aires, Adiós Pampa mía, Taquito militar and many others. 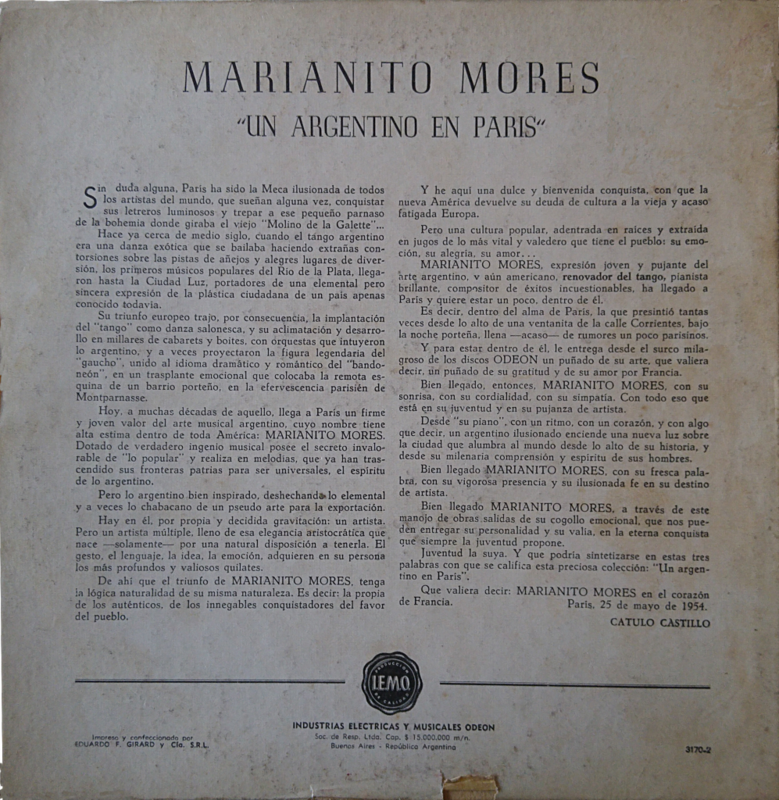 Today I received a very interesting 10” LP published on the Odeón label in Buenos Aires in 1954. 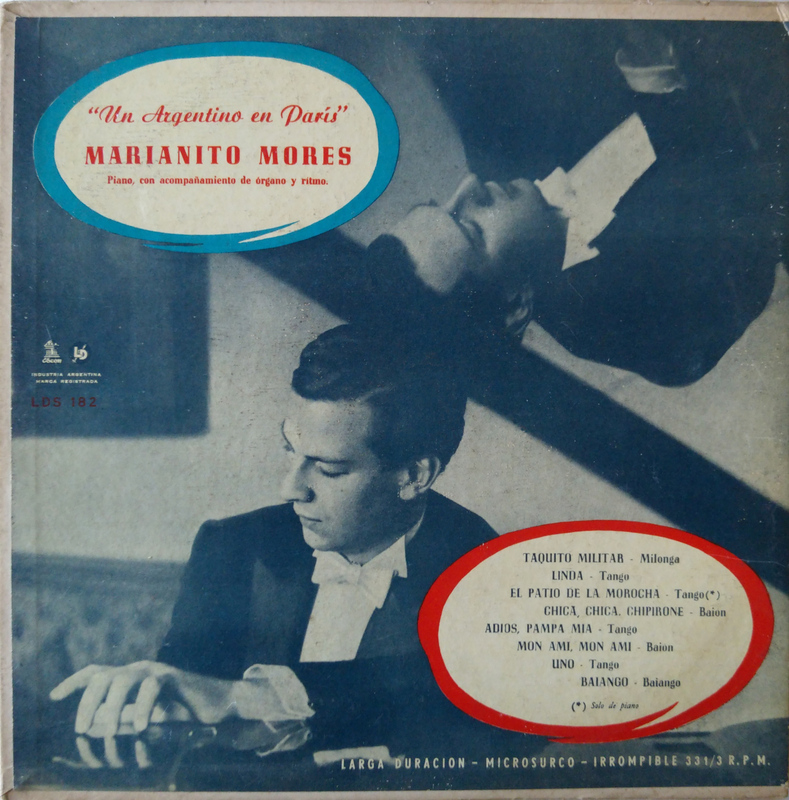 The titel is “Marianito Mores – Un Argentino en París – Piano con acompañamiento de órgano y ritmo“ It is less suited for dancing and has a more recital, jazzy character. 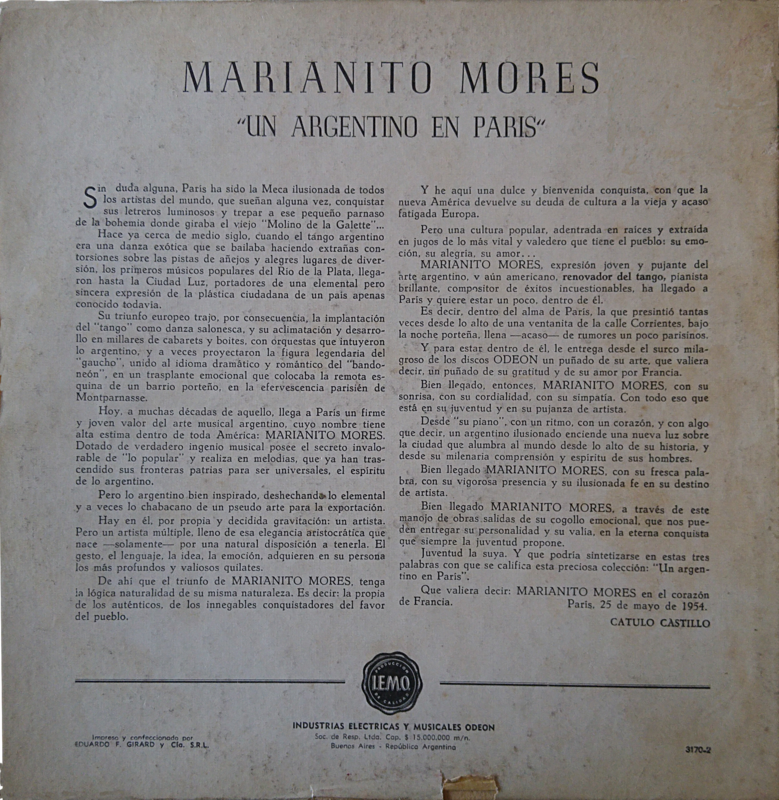 The 2 x 4 titles were recorded in France (grabado en Francia) and the vinyl record then pressed and published in Buenos Aires. All tracks are composed or co-created by Mariano Mores. The record number is LDS-182, it is a very low number, so we are most likely very close to the beginning of this Odeón series which might have started as early as 1953 with some Francisco Canaro, Rodolfo Biagi and Roberto Firpo re-editions. You can crosscheck this via Christoph Lanner’s Francisco Canaro Discography, he mentions the LDS vinyl re-edtions in the Electric Recordings Part II (1935-1973). The LDS series produced also Argentine folklore and jazz titles with artists like Atahualpa Yupanqui or Oscar Alemán. Interp. : Oscar Alemán y otros. Disco Odeón No LDS 109. 1.000 ejempl. $ 49,75; Bs. As., 2 de mayo do 1953. (Argentina). Intérp. : Oscar Alemán. Disco Odeón No LDS 111. 1.000 ejempl. $ 49.75; Bs. As., 2 de mayo de 1953. (Argentina). Interp. : Carlos Gardel con guitarras. Disco Odeón No LDS 112. 1.600 ejempl. $ 49,75; Bs. As., 2 de mayo do 1953. (Argentina). Compared to 78-rpm records of the day these early vinyl circulations were very low. The same source shows that for instance D’Arienzo’s 78-rpm record “Don Juan, Sin Balurdo, RCA 68-0236″ from 1950 was republished at 20000 copies in 1953, that’s ~20 times more circulation (plus the first issue)! E. Podestá. Música: SI. s Ponzlo. Faz "B": Sin Balurdo. Tango. Letra: -Carlos Bahr. Música: J- D'Arienzo y F. Salamanca. Intérp. f Juan D'Arienzo y su orq. típica, Disco Víctor NO 68-0236. Bs. Aa." 2312163. 20.000 ejempt.- $ 9,96. I wonder if the declaration of the number of copies was a legal requirement. If that’s the case, it must be possible to get precise circulation figures for a lot of tango recordings. LDS-182 is the oldest South-American tango 10″ LP vinyl record I have seen so far with a genuine content directly being produced and published on this medium. During the whole 1950s most of the Argentine records were still published on 78-rpm shellac records and sometimes, at a later moment, regrouping vinyl samplers were published. According to what I have been able to verify, the Odeón LDS series was in the beginning mainly meant for such republishing editions until this Mariano Mores creation. It is said that during the first years his stage name had been Marianito Mores, like written on the present record. Later in 1955, when the Perón gouvernment was brought down by a military putsch, being a peronist, he felt changing his name would bring him a certain protection. He called himself ever after Mariano Mores. The oldest genuine Argentine tango vinyl production is most probably the Music-Hall 7″ series of Carlos Di Sarli starting with the record number LP-1001 and published in February 1952. On some of these small vinyls, EPs, the production site is indicated with Peru. So most likely they were produced in a plant outside of Argentina. This is certainly something to investigate more in depth … Also the fact that the series shortly after was continued to be published on shellac (which is some kind of a regression). The following video is taken from the 1953 movie “La voz de mi ciudad” and not directly related to the record. But it contains a nice jam session around the milonga “Taquito militar“. in 1 day and 16:44 hours. in 6 days and 17:44 hours. in 14 days and 19:44 hours.